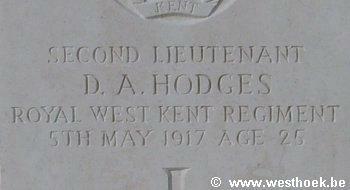 Second Lieutenant DANIEL ALFRED HODGES 3rd Bn. attd. 10th Bn., Queen's Own (Royal West Kent Regiment) who died on Saturday 5 May 1917. Age 25. Lieutenant Daniël Hodges, age 25, 3rd Royal West Kent Regiment, made the design of the two candlesticks near the fontstand in Talbot House (Poperinge). The two tall oak candlesticks were made from the carved posts of an old bedstead in the autumn of 1917. They were the gift of Driver Ketchem of the Canadian Royal Garrison Artillery. Each cone bears a small strip of shell case commemorating the Australians and Canadians who worshipped at Talbot House. The Australian candlestick was especially in memory of the Australian Engineers whose lives were sacrificed in the tunneling operations during the Messines Offensive. Daniel Hodges was killed before the work could be completed. He had gone out to bring in a wounded sergeant, and going out again for another wounded man, got killed himself. (Info : Brochure 'Talbot House', vzw Talbot House van Poperinge) Second Lieutenant DANIEL ALFRED HODGES 3rd Bn. attd. 10th Bn., Queen's Own (Royal West Kent Regiment) who died on Saturday 5 May 1917. Age 25. Son of Daniel Alfred and Emma Frances Hodges, of Newbury Rd., Bromley, Kent. 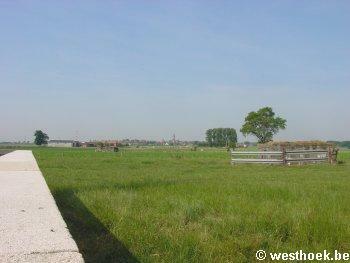 OOSTTAVERNE WOOD CEMETERY Grave I. H. 14.